The rudra veena is an ancient Indian instrument which is rarely played today. It caught my particular interest and for over two years I was priviledged to be a student of Pandit Hindraj Divekar in India. Learning this instrument opened a completely new world to me. 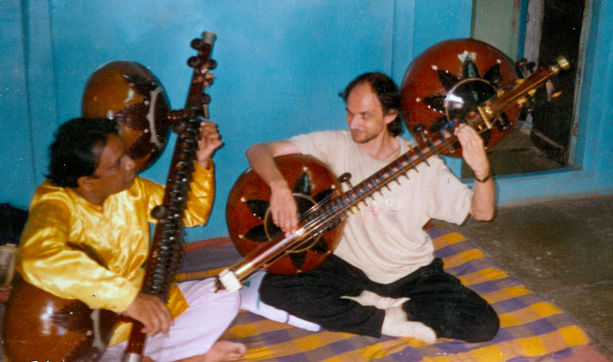 The rudra veena is a very quiet instrument despite being quite a large one. Because the neck with the strings sits on top of the two gourds, only a small fraction of the vibration is released as sound. (With most other instruments the neck is build directly into the resonant body.) But you can hear the deep sounds in the gourd which is right next to your ear. So many overtones! I learned to listen, and through listening I learned to allow myself to go deeper into the universe of sound. Each sound has the possibility of infinite expansion. It was an almost scary discovery. More and more I came to experience what it is that invites these moments of infinite listening and depths: my own sensitivity and presence. And so my intention to learn Indian classical music shifted into the background and gave way to my interest in the art of listening. I discovered a new approach to music which I call Musicality. I don’t play the rudra veena anymore today. I find the same depth in other instruments and the voice. Here you can listen to the sound of the rudra veena. I recorded it myself on a tape, with no equalization or effects applied, in India in 1994. The instrument is extremely difficult to record because of its low volume and deep frequency range. Also, I was eager to catch the sound that I heard with my left ear close to the gourd while playing. This rudra veena is tuned to the low D (one note lower than a bass guitar) and it can reach over 3 octaves higher.